Just when you thought you were on top of your probiotic game, in come these new probiotic drinks. Well, if you’re anything like me, then you get openly excited and shamelessly intrigued when you see new health products popping up. This is especially true if they fall into the ever-wonderful probiotic foods category, YAY! I swear perusing through Whole Foods is one of my favorite (and most expensive) pastimes. Even my boyfriend notices my extreme, childlike glee when I find a product I can have! So I’m naturally inclined to learn more with these beneficial bacteria beverages cropping up. I have IBS (Irritable Bowel Syndrome) so it’s a must for me to get my daily dose of probiotics. Probiotics are literally a life savor with keeping my painful symptoms in check. 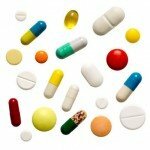 I’ve tried probiotic supplements, gummies, yogurts, and powders. You name it I’ve tried it! I’m always up for trying something new to keep my gut as healthy as possible. 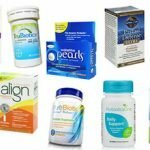 So let’s figure out what probiotic drinks are, how they can help us, and some good contenders to spice up your daily dose of probiotics. I’m sure you know about probiotics in general. They’re friendly, living bacteria that help repopulate your gut and improve almost all areas and functions of your body. So these new drinks contain the same things as probiotic foods and supplements. Probiotic drinks have live and active cultures of beneficial probiotics and come in many different forms. It can be anything from sparkling flavored tonic waters to fizzy, sweet-and-sour fermented tea like kombucha, to drinkable, milky yogurts such as kefir. The good bacteria can come from a few different sources like fermented dairy, fermented veggies, or sometimes they’re added to the drinks during manufacturing. Keep a look out for products labeled, “contains live and active cultures” and “living food”. This is a green light for gut bacteria, which is great! Flip the product over and look at the ingredients label. Look for bacteria that’s in the lactobacilli or bifidobacteria families. Your perfect probiotic drink should have at least a few different bacteria strains and 1 billion CFU or live cultures. Let’s check out some options that are worth your while. New probiotic drinks keep sprouting up. Here are 4 healthy options that are definitely worth a try! 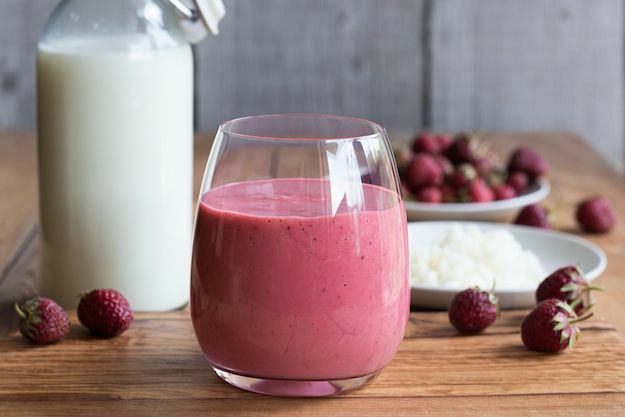 Think of kefir as the adult version of a drinkable yogurt or go-gurt. It’s more sophisticated and complex. It usually has additional and different probiotic strains than you’d get with your average sip-able or slurp-able yogurt. Kefir is loaded with friendly belly bacteria. With this adult go-gurt, you’ll notice a difference in taste, as well. This fermented-milk beverage is on the tangier side of things. 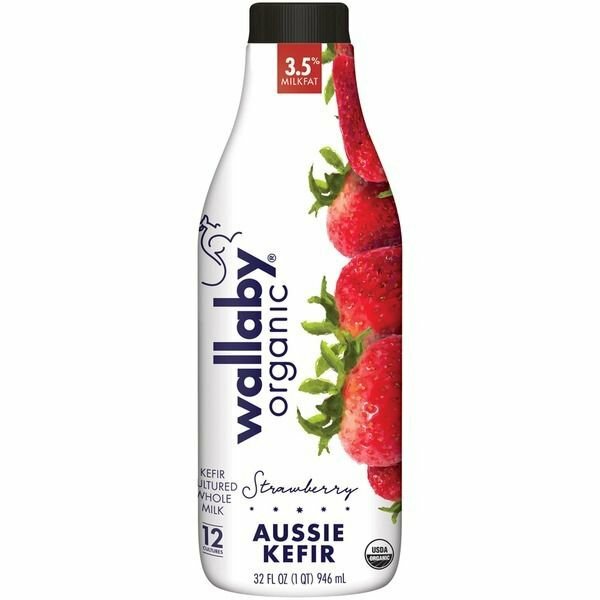 But Wallaby is a particular brand that happens to be a little less sour compared to others. For one, it uses whole milk and second, it has strawberry and peach flavors that are sweetened. So if you’re a newbie, you might be better off starting with this specific kefir drink. Fear not if you still find it hard to drink. You can always use it as a base for your smoothies and add in fruit, seeds, veggies, etc. to help mask the taste. 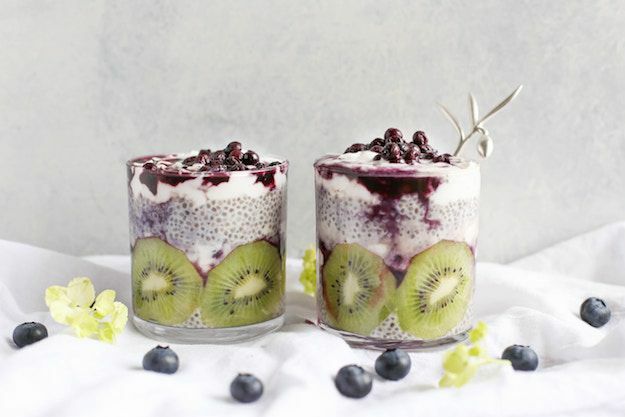 You’ll be a kefir drinking pro in no time! Wallaby has plain, strawberry, and peach flavors in their 32 oz. bottles. Each bottle has 4 servings. They have a whopping 12 probiotic strains in each! CULTURES. INGREDIENTS: CULTURED PASTEURIZED WHOLE ORGANIC MILK, ORGANIC STRAWBERRIES, ORGANIC CANE SUGAR, NATURAL FLAVORS, ORGANIC LOCUST BEAN GUM, PECTIN, FRUIT AND VEGETABLE JUICE (FOR COLOR). There’s 200 calories per cup or serving and 7 grams of fat, 1 gram of fiber, 23 grams of sugar, and 7 grams of protein. Doesn’t this just sound like a whole lot of gut goodness going on?! This drink is fermented with a proprietary water kefir culture and has 4 billion live probiotics per 15.2 fl. oz. bottle. 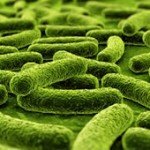 There are 4 different probiotic strains, as well. It’s crisp, light, and refreshing and comes in an abundance of delicious fruit flavors. It’s a super healthy option especially if you’re watching your sugar and calorie intake. There’s only 25 calories per serving (2 servings in each bottle) and 3 grams of sugar per serving. This drink doesn’t use any icky artificial sweeteners and relies on stevia leaf extract and real fruit juice as natural sweeteners. The ingredients vary depending on each flavor. This drink is non-dairy, gluten free, vegan, certified USDA organic, kosher, and non-GMO. That checks all of my boxes and more! Chobani is one of my go-to brands for yogurt and naturally they have delicious sip-able options, too. 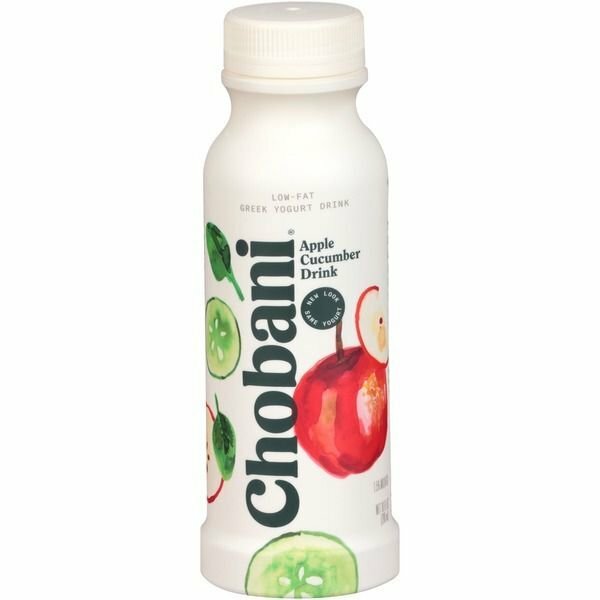 The “Apple Veg” flavor of Chobani Low-Fat Greek Yogurt Drink is a fan favorite! The apple and cucumber combo is a crisp and refreshing pairing that ties together perfectly for a delicious drink. But they have 10 other yummy flavors if the Apple Veg doesn’t strike your fancy. This drink is made with low-fat Greek yogurt and has 5 different probiotic strains to boost belly function. Each bottle is 10 fl. oz. and 200 calories, 5 g of fat, 1 g fiber, 22 g sugar, and a whopping 14 g of protein! They also contain 30% of your daily value for calcium. Low-fat yogurt (cultured pasteurized nonfat milk, cream), water, evaporated cane sugar, apple puree, cucumber puree, natural flavors, spinach juice, chicory root fiber, fruit pectin, locust bean gum, lemon juice concentrate, turmeric and fruit juice concentrate (for color). We couldn’t discuss probiotic drinks without mentioned the almighty kombucha! Kombucha can be an acquired taste but there are an abundance of die-hard, gorgeous gut fans out there that simply can’t live without it. The fermentation process is where friendly bacteria, enzymes, and yeasts mingle with and eat the sugar in sweet tea. This activity turns into a bubbly, probiotic-rich kombucha drink. The taste can range greatly from pleasantly sweet n’ sour and crisp to strong, pungent, and vinegar-like. If you’re sensitive to dairy, kombucha is a great alternative for getting in your regular dose of probiotics. Health-Ade is a wonderful brand that beautifully mixes together high-quality ingredients and taste. All of those probably make sense except for scoby, right? Think of scoby as the coral reef for bacteria and yeast growth. 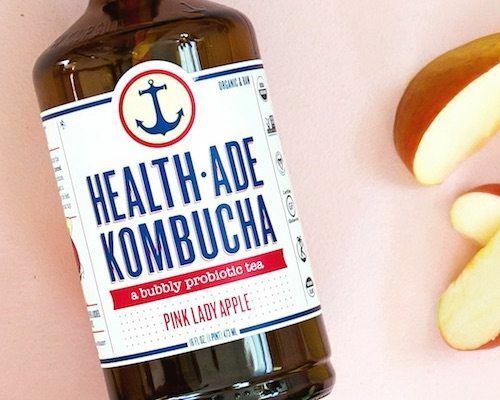 Health-Ade does things the natural way and it can take up to 4-weeks to make 1 bottle of naturally fermented kombucha. Kombucha is low in calories, caffeine, and sugar. This bubbly probiotic super tea comes in 14 awesome flavors to choose from. A special glass only fermented kombucha to prevent harmful plastic & metal leaching into the drink. The smallest batch kombucha – brewing one case at a time in 2.5-gallon glass vessels for the highest quality beverage. Flavored with high quality ingredients like cold-press juice from organic produce. Packaged in dark-colored glass to protect the delicate probiotics from UV light. It’s also raw, gluten-free, vegan, non-GMO, kosher, and certified organic. The “Pink Lady Apple” flavor is slightly sweet, exceptionally crisp, with a hint of cider. It’s like a sophisticated sparkling apple cider. 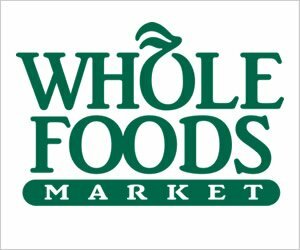 Filtered water, kombucha culture (yeast and bacteria cultures), organic black tea, organic green tea, organic evaporated cane juice (sugar), fresh cold-pressed organic apple juice. It’s crucial to get probiotics in your diet, whether you have a digestive disorder or not. Probiotic drinks are teeming with healthy bacteria to help your gut, immune system, and so much more. The next time you’re at the grocery store, try one of these 4 drinkable probiotic products! 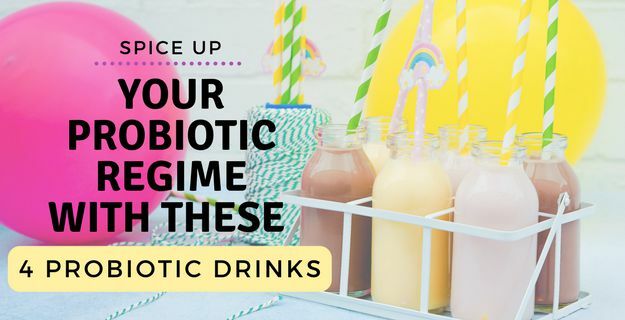 These drinks will help spice up your daily allotment of friendly, probiotic bacteria!